To Learning Guitar - And How To Overcome Them? without pain… and having a blast the entire time! at the Special Low Price Now! We start teaching a beginning guitarist and pretty soon they run into one the five most common mistakes that lead to failure and discouragement. (we'll tell you what they are in a minute). These mistakes show themselves in many symptoms. Maybe you've experienced these yourself: buzzing strings, sore fingers, difficulty forming (or changing) chord shapes, "string skipping," or difficulty finger picking. And that's just for starters. For many, these obstacles become insurmountable walls. Or what we like to call "dream-killers." It's such a shame, because they're really just tiny speed bumps when you understand WHY you're having these issues. Fortunately, after teaching hundreds of students in person over many years, we have developed quick fixes for these hurdles. "If you only knew how close you were to playing that favorite song you want, you'd freak out and tell us to leave so that you could practice some more!" Seriously… these obstacles are so firmly rooted in such fixable issues of basic movement and finger placement that they feel as curable as turning a steering wheel. In other words, you get EXCITED when you realize how correctable these problems are. You're immediately MOTIVATED because you understand you'll never experience these difficulties again. And practicing guitar becomes FUN because you're creating music and playing songs, not just banging a crashing collection of awkward-sounding notes. That's why we spent months filming an essential set of lessons called "Beginners Breakthrough." 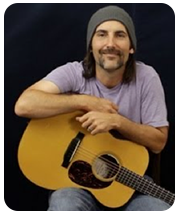 It's an amazing series of step-by-step lessons from the one and only Brett "Papastache" Papa that take any raw beginner who's never even held a guitar before all the way to playing complete songs easily and way faster than you've ever dreamed. And then it shows you how to execute all the tricks and techniques to take you into more advanced phases, allowing you to blow away your friends with awesome musicianship. Special Low Introductory Price Now! Look, guitar ain't the easiest thing to learn. But it's the absolute BEST, COOLEST and most REWARDING thing you'll ever do. Which is why you need to be on guard for the very real obstacles that get in the way. Look, first of all, the chord shapes themselves are hardly intuitive. If you've never played guitar before, they're unlike anything you've done before. And of course changing chords means abandoning that shape and changing it into a new one in a different area on the neck. If it seems hard at first, well, it IS! But remember how riding a bike seemed hard, too? Once you master the basic rhythm and balance and movements, it becomes easy. And you're not only able to change chords easily, but you can do them quickly, which is what you have to do when playing a complete song. What we do is break each shape down to its most basic element, allowing you to more easily master it. And then you commit it to muscle memory. Too many teachers skip crucial parts of this process, which leads to unnecessary frustration and the absolute falsehood that learning guitar is difficult. Example: E minor is a chord almost anyone can do it in a few seconds. But if you're asked to go from, say, E Minor to C Major, then you'll probably fail and get frustrated. What we do instead is layer on more doable steps that are so easy you don't realize how fast you're advancing. It's like building a house. You can't put up those fancy windows without pouring a solid foundation first. But pretty soon, you're going up the lesson staircase so steadily you're astonishing yourself with how far you've progressed. To get all these steps in one easy-to-learn system, click here. Getting Strings to "Ring Out" Properly Playing a chord is one thing. But can you make it sound the way it should? Or, as we like to put it, can you you make your chords "ring out"? This is such a common problem! And it's all about proper hand position so that ALL your strings ring out. Common causes include fingers not pressing with the right pressure. Some people have the wrong angle with their fingers. Others are too "up and down," making their palm hit the bottom of the fretboard which mutes out the E string. Or it could even be from having your fingers too flat and not curved enough. Or maybe you're not on the tips of your fingers enough so that you're hitting the strings properly. Whatever the reason, you want to be able to hear all the strings ringing out loud and proud! Our system starts you out slowly and gradually, strumming on just one chord. When you jam on just one strum pattern on one chord instead of trying to learn three chords right off the bat, you get it down stone cold, setting the table for bigger and better things. When you take the time to follow the steps in our system, you'll soon be able to pluck whichever string you want without even looking, and you'll be doing it instinctively. Grab this system for yourself here. Contrary to what you might think, rhythm CAN be taught. We don't care if you think you don't have a musical bone in your body, Brett has a way of teaching rhythm that gets you in sync quickly and naturally. Trust us, EVERYONE has this natural rhythm inside them, and Brett can show you how to unlock yours. One way Brett helps you develop proper rhythm is through a series of strumming techniques that, again, start simply and build in a logical, progressive fashion. Still skeptical? Then watch an episode of that show, "Dancing with the Stars." And see how ordinary, flat-footed newbies begin soaring around the dance floor like Fred Astaire once they're paired with a dance professionals. Will you turn into Pete Townshend or Keith Richards overnight? Of course not. But we are saying that rhythm is learnable, absolutely. Develop rhythm and every other essential guitar skill here. This course shows you how to use your favorite music you already know and love. It's all part of our "master plan" to get you HOOKED and playing guitar for LIFE. Listen, there's only so many things you have to worry about when learning guitar. However, they can become overwhelming if you don't learn them in a structured, logical fashion. You can see the description of each DVD below, but basically you'll see that you learn everything in a safe, sensible order. This removes about 95 percent of the frustration, believe it or not! You'll learn the most common chords, then how to strum, then how to apply two of the chords together with that one strum pattern, then applying a popular song putting those chords together, etc. Then we go onto more complicated chords, then half chords, then different kinds of strumming- and then all sorts of other super-ninja stuff, but you'll never be asked to learn something before you're ready. And that's huge. Bottom line: it means you'll be rocking out and playing your favorite songs before you know it! on sale at this special "re-launch" price. How to count in your own head automatically so that strumming makes sense. This makes your playing fluid and easy. Bar chords, suspended chords and every other super cool chord you would ever need to know in order to play all the most popular songs of yesteryear and today. How to make your own strumming patterns to create your own unique sound and keep things interesting. Invaluable little tips and tricks, such as how to take the same old chord progressions and add muting to make it sound more modern. How hard should you press the strings? You'll learn this crucial fundamental to sound good and keep your hands strong and healthy. How to combine chords and melody together for amazing possibilities and to give yourself the "blow away" factor. Nearly every song you've ever loved is composed of more or less 4 chords. That's why my course teaches you more than 30 of these progressions, which means you'll now have everything you need to play any song you've ever dreamed of playing. Not only that, but we'll show you how to combine those chords and achieve the correct FEEL required to play the various style you want. That means you can play anything you want, whether it's pop, reggae, funk, pop, country, hard rock, heavy metal and more. They all utilize the same principles, so go to town and have it all! We start at "Square One" because this gives any newbie the confidence and excitement to move forward as far as they want to go! We start out learning all of the parts of the guitar: string names, the nut, bridge, neck, tuning pegs, and how to tune. Then we learn basic chords: Em, A, D, G, and Cadd9. Crucial to this is teaching you finger pressure and how not to press too hard so that we can practice without pain. Some basic strum patterns and how to do down and up strokes. 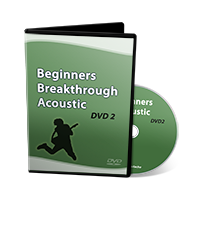 Additional strum patterns to help you get closer to learning the popular chord progressions in the other DVDs. Now you're off and running and there's no looking back! We will start getting into minor chord progressions as well. Then we will start using progressions with moving bass lines both walking up and walking down with our bass notes. You'll also get into our first popular rock and southern rock chord progressions. Yeah, baby! Next, we start using muted strumming to get into more modern song progressions. Using a capo is also a popular tool in song writing to easily change keys, so we'll will go over how to use a capo and put on a capo. Also on this disc is a ton more popular chord progressions as well as country style rhythms. We love this DVD because now it's time to learn bar chords used in countless popular songs! Don't let anyone tell you bar chords are difficult — Brett has some ninja tips and tricks that make them a breeze. We will go over the four most popular major and minor bar chord shapes. Then we will discuss muted bass notes with our bar chords to get that punchy guitar sound used in everything from punk to country. You'll also learn more rock, country, and punk style chord progressions to get comfortable with using bar chords all over the neck. Suh-weeet! It just keeps getting better …. learn different ways to use the open style chords that we already know, using different fingerings inversions and adding and subtracting notes to get cool new sounds from the same old shapes. We'll experiment moving one chord shape all over the neck so that we can stay with one chord shape and get different chords just by moving around the shape. (Can you say "awesome shortcut"?) You'll learn some popular songs that use this one shape technique. Next, it's for more muting by using different muting techniques used in style like funk, pop, and country. Then you'll learn faster style strumming or 16 note strumming used in countless modern pop and folk music. We also cover Hendrix-style rhythm playing using both chords, parts of chords, and single-note melody lines within the progression used in everything from R&B to hard rock. You'll also learn famous style progression using suspended chords to get that cool alternative sound. It is time for more moving bass lines, yo! This will help your finger dexterity and chord switching as well as your picking accuracy. We will start using more single note picking within our progressions heard in countless pop and country style songs. We will learn how to take pop progressions and turn them to country so we can use the same old chords and progressions to play or write easily in the two popular styles. Since reggae is such an awesomely popular style of playing used in ALL styles of music today, we go over the fundamentals of how to get that super-cool reggae rhythm sound easily. We take the movable chord shapes we learned in previous DVDs and take them deeper by learning even more popular progressions that use this great sounding trick. Then we step it up a bit and learn hybrid picking which uses both the pick and our fingers at the same time. This gives you countless ways to play the chord progressions you've learned, meaning you can either pick or pluck the strings at will. Next, because you've been learning in such a logical, stair-step fashion on all the discs, it's time to master some of the more difficult chord progressions, not to mention some cool tools on how to create your own. Play with confidence for myself or others! Click below now to receive your copy of the "Beginners Breakthrough Acoustic" Series 6-DVD set PLUS 2 Bonus Gifts with FREE SHIPPING anywhere in the world. WAIT! We're Not Done Yet! This bonus is our “Let's-make-this-a-total-no-brainer-for-you” gift. Why do we say it like that? It’s because this bonus means you get immediate access to the massive guitar lesson portal at Guitar Jamz for 90 DAYS. 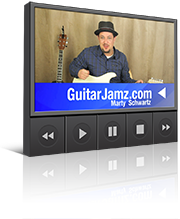 Marty Schwartz and a roster of renowned, all-star guitar teachers have contributed more than 1,800 video tutorials in ALL styles over at Guitar Jamz, including rock, blues, metal, shred, country, jazz, fingerstyle and even reggae. This will let you supplement Brett's course with whatever else you want, for 90 full days. This is a $75 retail value that you get for FREE. Let's make this easy for you. We want you to order with total confidence, which is very easy for us to do because everyone loves Brett Papa's tutorials so much. When you order today, you automatically get a Full 90-day, "no questions asked" return policy on all our DVDs. No hassle, and no worries. And no restocking fee or receipt required, either. You have our word on that, period, full stop. Simply put these lessons into practice and watch yourself playing guitar WAY better in the shortest amount of time possible. Get started rocking out today — we cannot wait to hear about your progress! Have some fun and LET'S DO THIS!! P.S. Can you imagine how awesome it will it be to be able to play pretty much any song you've ever heard for yourself and others?!! That's what you'll be doing after watching these lessons. P.P.S. Remember, Brett has dramatically reduced the learning curve and eliminated frustration by structuring these lessons in the perfect order and keeping things simple. Nothing is taken for granted. Your skill will steadily build upon itself and I keep it FUN all the way through. (Otherwise what's the point, right?) You won't be a beginner anymore after these lessons — you'll be an intermediate player with room to soar even higher. P.P.P.S. Please note that the special low price on this page, as well as the free bonus gifts are part of our celebratory "re-launch" and will be removed promptly at the deadline posted on this page. Grab your copy with free shipping to anywhere in the world and know that we are taking all the risk for you with our 100% no-B.S. guarantee. © 2012 - 2017 Copyright Papastache.com. All rights reserved.